eeza465: A. 1. Well, I guess now's the time to tell about who I am. My name is Ryan, I have been a fan of Lego for as long as I can remember. I live in boring Michigan (it really is boring no joke). I live on Wisteria Lane, oddly enough, that's the street name for characters in the show 'Desperate Housewives'. I'm home schooled so I get a lot of time to build frequently. Oh yeah, I've been to China before too. Just saying. ROOK: Cool so although you live in the middle of "no where" you've seen a bit of the world. ROOK: Q. 2. What was your first set? 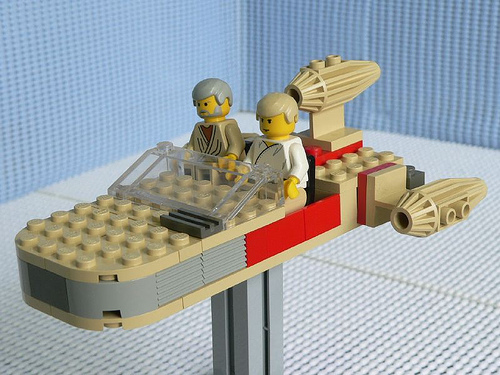 How did this influence your love of Lego? eeza465: A. 2. My first ever Lego exposure was a bag full of Duplo I got when I was like two years old. But I really got into Lego when I got my first ever Lego Star Wars set. Which is the old 'Luke's speeder'. I constantly re-worked the set into different things which really started my love of Lego. ROOK: Oh no’s! Duplo! Well that has given you a good basis of basic building knowledge long before the classic bricks. ROOK: Q. 3. What got you into the Lego online community? Did you ever have a “dark age”? eeza465: A. 3. I first started in the Lego online community when I first started posting small things in the Lego site itself. That eventually led finding Lego stop motion videos. Which led to me finding out about CAC. Which led to me finding theCABG.net in 2009. That's when I really started to get into the online Lego community. Also, I did have sort of 'dark age'. About two years ago when I thought that 'Lego made me un-cool' or some crap like that. I kind of wanted to get rid of my Lego but they were a part of me and I couldn't let them go. About a year ago I started to gradually get back into Lego and realized that I loved Lego. ROOK: Q. 4. What is your favorite MOC? Why? eeza465: A. 4. Oh that's a hard question for me. But I would have to go with my recent "NEC Fortified Outpost #24". I just love that thing. It took me a while to build it, but it was well worth it. ROOK: Q. 5. Who is your favorite Builder(s)? Why? eeza465: A. 5. Another hard question! I would have to go with Legohaulic. He makes some of the most ingenious things with the most outrageous techniques. The things he can create with Lego are absolutely amazing. His builds challenge and inspire me to make better builds every day. ROOK: Totally agree! I think he was one of the first users I “friend’d” on Flickr. ROOK: Q. 6. What is your preferred Theme? Why? eeza465: A. 6. I would have to say my favorite theme is Star Wars. I just love Star Wars. It's always been my favorite theme and I can build decent Star Wars themed MOCs. Even when I was younger it was my favorite type of thing make. I don't think I'll ever stop building Star Wars creations. ROOK: Q. 7. What do you see for your self in future, as far as long term projects? ROOK: Maybe you and I should have a little head to head tower building competition this fall after CABGOIII. ROOK: Q. 8. Tell us about something that wasn’t asked above. Great interview, and I'm also from Michigan! Love this! /Do more Rook!! When you brought up his first set, that brought some nice memories to me. Eeza and Bob I deleted some of the personal stuff you just posted. This thread is public and you never know what kind of creepy *** bastards there out there. That was probably for the best then. Sorry about that. Hey no worries it's a spot light about you. I just thought it might be over share. Personally I don't mind people knowing what state someone lives in or city if it's a big city. But towns become very specific and easy to track people down. I'll give people my address via PMs for the purpose of mailing packages but in exchange I have their address. A mutal respect of sorts saying "yes" we both know where each other lives. But posting that info on a public page invites someone who is not known to the community to simply view the information and then use it without a trace of how they got it. And besides I work in Justice Services. I see creepy a** crap like that all day. I don't want it happening here on our forum. Not only creepy, but people can do some evil things.. Been there;Done that. So how do you qualify to be in the spot light, which until now I never knew existed? I'd order you pizzas every hour... Just saying. If I had your address of course. As a troll. To annoy you. Wow that was rambling. Good to hear about you. And your favourite MOC is by far the best one you have made. @ Train: You qualify. We use to do this stuff regularly. Then we had the same ADMIN, MODs, & Council Members for a long streak. I though of this because I purposely pulled in some "new" blood to this cycle. Therefore I started with the two newest members. Still waiting to hear back from Bob though. I'm really please with the current council we have a lot active and good builders on this time. Nice highlight what you can do and why you were chosen to serve. pyro of the 19th wrote: I'd order you pizzas every hour... Just saying. If I had your address of course. As a troll. To annoy you.